How’re you doing? This is Rob Allison with Rob’s Detector Sales. I’ve recently had a lot of questions about signal amplifiers and external speakers and various combinations to use on the Minelab. I figured this would be the easiest way to demonstrate and show you the different types of amplifiers and external speakers that are available. The first amplifier, or signal enhancer is actually what it’s called, is the one made by Super Sound or DETacc. Now there’s different versions of the DETacc signal enhancer that’s out there. This particular version has basically just a volume control. The older version actually had a bypass switch, which had a tendency to go bad after a certain amount of time of being used. So this is actually the newest version, built by Doc, and specifically to Doc’s specs…without that bypass switch, to eliminate any kind of warranty issues. This Super Sound is specific for the 4000 or 4500, but they make it for any of the SD Gp Series and up, also the GPX series (Minelab GPX 5000 metal detector and 4800). You just have to be specific when you order the actual Super Sound. 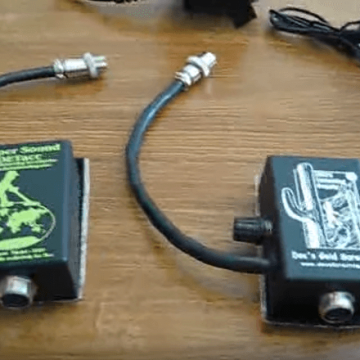 The newest signal enhancer is actually the one that just recently came out, is actually the Gold Screamer, it’s made by Doc, it’s the newest version, it basically in my opinion has a little bit better quality parts. The DETacc by any means is a great signal enhancer, the Gold Screamer is just the lastest and newest version that’s out. Now with either of these signal amps, there’s an external speaker that’s available. And that would be this little guy right here, and actually it has a quarter-inch jack that you can actually plug-in to any battery system, or if you’re using the Pocket Rocket system, you’d plug it right into the regulator. But basically this is the high-quality regular speaker. It has two different options as far as mounting, it has this little bracket right here that you can use if you want to hang it from something, or you can actually remove these two Philips-head screws, and it has this clip right here that actually attaches to that, so you can actually hang it at the different angle…or you know, just different specifics on this one. So there’s actually two options as far as mounting on that one. But this little guy right here can be used with either of the (Doc’s) Gold Screamer or the DETacc signal enhancers. The next system that’s available, getting out another one, is thos guy right here. And what this is…is basically an amplified speaker, and you don’t actually have to use any kind of signal enhancer, this actually has a built-in amplifier in the speaker, so it’s basically an amplified speaker. It has an on/off switch on the top. These are really good for any kind of field instructions, it’s what I actually use for most of my field instructions, for new detector purchases…makes it real easy to demonstrate different things in the field. All of these accessories that I just showed you all have a 1-year factory warranty on them, so you don’t have to worry about that. There’s also these little guys right here, a lot of people have been asking about these, these are basically little gender adaptors. You can actually adapt a 4-pin to a 5-pin, so you can actually adapt signal enhancers, battery systems, and stuff like that. So you have an old SD system with a 4-pin, you can actually adapt some of those accessories to the GPX. These guys right here, they come as a set, about $22. A lot of people don’t know about them, so that’s why I’m just trying to let you guys know that they are available. A lot of times rather than buying another amplifier to go on your new system, you can actually use these little guys to adapt your older or GP versions to that of the new GPX. And that should conclude this…like I said, there’s different options…a couple of different signal enhancers, an external speaker that can be mounted on either of these two right here, or the amplified speaker which don’t need a signal enhancer, the speaker’s actually amplified itself, and these little gender adapters. If you have any questions, please feel free to give me a call anytime! This is Rob Allison, with Rob’s Detector Sales. Thank you! I posted this video originally to my YouTube channel, on June 1, 2008.